In what condition should I buy my concrete pump ? When choosing the type of concrete pump to acquire, there are 3 categories you can pick from: New, Refurbished concrete pumps or Used. In some countries, it’s not easy to find skilled mechanics and suitable parts, and in some cases it’s almost impossible. If you are trying to import a concrete pump, you should check the brand’s local presence first, as the last thing you want is to have your machine down for too long. When buying a brand new pump, the chance of breakdowns are reduced dramatically, but the cost of acquisition is far higher. When buying a refurbished pump, the majority of the mechanical issues have been addressed. JED Alliance Group has a Quality Assurance Process, where we fully strip the concrete pump’s parts and assemblies, inspecting every element of the mechanical, electrical and hydraulic systems. 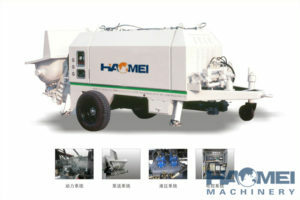 We then proceed to purchase new original spare parts and refurbish the machine up to factory specifications. Next, we apply epoxy primer and enamel paint to reduce corrosion, before finally applying brand new safety stickers and logos. When the restoration is complete, we pressure check the whole unit and pump water under the highest pressure possible through the system. We want to know that if the machine breaks, it happens in our shop and not at your job site. You would completely lose all these safety tests and assurances if buying a used unit that you have never seen before. You never know if a previous owner could have caused irreparable damage.